Performance “Knot” explores group of young people that are “hanging around”. Knot, inside each of us, can be tied, untied and streched. Idea about symbolics of knot and his ambivalency: bordering and getting together, oriented us on loosing identity in life, in order to fit the majority. 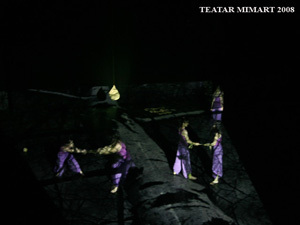 Transfering from rational perception into out-of-time space and vice versa, is made through video projection from the above. That is the only source of light on stage. If contemporary art should be reflection of social reality, no matter how traumatic, than hanging around can be considered as usseful waste of time.